Energy Rewards Program - save on monthly lighting costs. Energy efficient solutions for indoor and outdoor lighting. We offer the highest quality, quickest ROI solutions for LED bulbs, and Magnetic Induction fixtures. Why limit current Energy Savings lighting technology to your own needs? Our affiliates offer both indoor and outdoor lighting solutions that pay for themselves, and make you look even better to your accounts. When you hear the phrase "Going Green" you may immediately think "This is going to cost me more money." This is, in fact, not the case. When you save on energy consumption, labor in frequently replacing bulbs and ballasts, the collective savings add up - very quickly. By exchanging antiquated lighting with more energy-efficient lighting technologies, you end up saving monthly Energy Costs while going green at the same time. In short time, "Going Green" will pay for itself. The Multiple Media Network has created an Energy Savings Incentive Program to offer bulk-buying power on the items you commonly need, and items your customers commonly use. Most commercial interior lighting utilizes T-8 fixtures. These fixtures use fluorescent tubes, rated at 32 watts per tube, and 4 feet long. A single LED tube (22 watts) replaces two standard fluorescent tubes (32 watts each), and provides a cleaner, brighter-white light. Because you have replaced four 32 watt bulbs (128 watts) with two 22 watt LED bulbs (which now includes a 15% power reduction draw on the ballasts), you have cut your energy usage by over 65%, and have brighter visibility. Our LED tubes have a 50,000 hour life-span and a 5 Year Guarantee. So if you have your interior overhead fixtures on 10 hours a day, only 5 days a week, our LED tubes will last 19+ years! Use our online calculator for swapping fluorescent tubes to LED tubes to see the annual energy costs savings. This typically applies to internal machine cabinets, interior office & retail space lighting. Per Year in ELECTRICITY Alone! This is the obvious lighting solution for any retail, warehouse and interior commercial space with high ceilings (see before and after example to the right) and especially any large scale exterior applications, such as parking lots and parking garages. 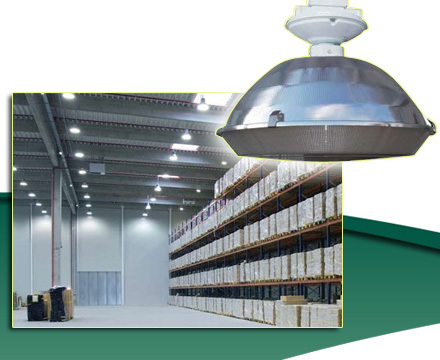 This is a VERY common example of replacing indoor warehouse lighting with Magnetic Induction Lighting. Metal Halide (before picture) is NOT the smart lighting investment. Magnetic Induction uses less than half the wattage, produces less than half the heat, and INSTANTLY turns on. Use our online calculator for swapping any High Intensity Discharge (HID) lighting to Magnetic Induction fixtures to see the annual energy costs savings. This typically applies to large area lighting, such as indoor warehouse, outdoor parking, garage and street lighting. How Do I Join ESIP? To find out about joining the Energy Savings Incentive Program, select the Enroll - Energy Savings button to the right. The online form takes only a few minutes to collect your information. Your local representative will contact you shortly. Recent press articles and videos about the latest in lighting technology. View and download PDF specification sheets for information on the latest in lighting technologies. 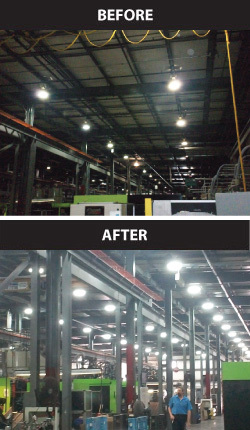 This is a VERY common example of replacing indoor warehouse lighting with Magnetic Induction Lighting. High-pressure sodium (before picture) is NOT the smart lighting investment. Magnetic Induction uses less than half the wattage, produces less than half the heat, and INSTANTLY turns on. The Multiple Media Network has partnered with manufacturers of only the highest- quality energy-saving lighting solutions. We encourage, and welcome, the opportunity to provide you with a no-obligation proposal of how to quickly reduce your monthly lighting bill. As with the purchase of any products, buying in bulk reduces the overall costs. We will gladly group bulk orders and drop-ship from our closest distribution facilities to service your needs. Select the button below to contact your local Energy Savings Incentive Program Representative.